Haley Patterson has had a crush on golden boy Bryce Colton for ages. But when she hears a rumor that he hooked up with her she gives him a choice: be her boyfriend for a month to show other guys that she's dateable-despite her overprotective and very intimidating brothers-or deal with the angry, cage-fighting boyfriend of the girl he actually did hook up with. Bryce didn't know the other Haley even had a boyfriend. He was just trying to get his ex off his back. And now, not only is he being blackmailed, he's being blackmailed by an honor student. His new "girlfriend" has two three-legged dogs, her father mows grass at the country club, and she's...well, difficult. And different. 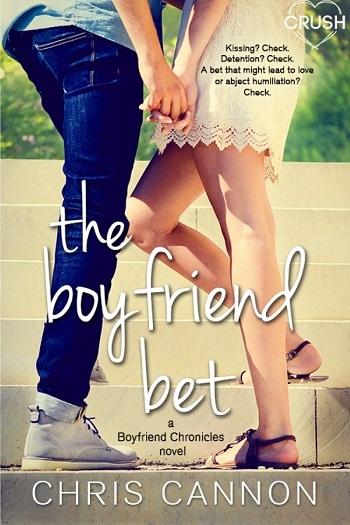 Disclaimer: This Entangled Teen Crush book contains one epic misunderstanding, two best friends’ flirtation on the side, and three-legged dogs. Warning: do not try this blackmail at home. Nine out of ten Entangled: Crush Publishing's books are a hit for me, and Chris Cannon definitely fell into this category. As a new-to-me author, the writing style was an easy flow, keeping me engaged page after page, with the book hitting its stride after the third-way mark. Haley has a pair of over-protective twin brothers who are a force field between her and any guy who may like her. In steps an unlikely rumor that either ruins her reputation, or finally gives her one. Needless to say, Haley runs with it, taking it in stride, which leads to the justifiable blackmail between Haley and Bryce. Bryce hooked up with another Haley over the weekend, and was given Haley's last name, so a rumor spread how she hooked up with the hottest guy in her school. Obviously she didn't – a pair of brothers – and an opportunity presents itself. Bryce ruined her rep, so as long as he pretends to be her boyfriend – to prove she is dateable – she will keep the 'real' Haley's boyfriend and her brothers from pummeling Bryce's pretty face. Blackmail Boyfriend has all you expect from a young adult novel, heavy on the angst. Let me repeat that heavy on the ANGST, and I ate it right up and found it deliciously gut-twisting emotional. Haley loves animals, is the landscaper's daughter, is level-headed, patient, and doesn't care about appearances. Therefore, she is the complete opposite of anyone Bryce needs in his life. As a rich kid whose family is the member of the country club, Bryce is uptight, OCD about order, and very gruff. Beneath the facade, there is a knight in shining armor Haley finds charming. Besides the main romance, there is a side romance between Haley's BFF and Bryce's good friend, Jane and Nathan, that was sweet and felt complete. Blackmail Boyfriend taught positive lessons, showed supportive friends and family, and was the magic of first love. Young Adult age-range: 13+ due to kissing and justifiable blackmail. Reviewers on the Wicked Reads Review Team were provided a free copy of Blackmail Boyfriend (Boyfriend Chronicles #1) by Chris Cannon to read and review.